The photo above shows a section of the mile-long paved beach walk that was constructed in Ocean Springs as part of ongoing recovery from Hurricane Katrina. It is a great place to walk and offers interesting visual appeal, wonderful breezes, and friendly people. That’s not all, though. Walking with a friend on the evenly paved, landscaped beach path is a healing social experience of exchanges about family challenges, triumphs and traditions; discussions on solving the world’s problems; and lots of laughter-generating conversation. My “hitching posts” where Ann (above) or Pat drops me off and I wait until they are parked. On top of all those benefits are the walkway benches that work better than any surface I have at home for some of my occupational therapy exercises involving my hand, arm and torso. At a particular bench located just about where I need a rest break, my walking buddy of the day helps me uncurl my left hand. She positions my hand with fingers pointing left and holds my fingers and thumb flat on the bench while I twist my torso in the opposite direction: twist and hold to the count of 10 and repeat 15 times. Then we reposition my left hand farther back. I go through the same routine then we move my hand even farther back. By the third position I am moaning, groaning and pretty much doing a super-speedy 10-count. But the payoff is worth it. Even pre-botox, at the end of these exercises my fingers are flexible and straight for a little while. And Ann and Pat share my excitement about those stretched out fingers. These ladies are effective and appreciated cheerleaders. Yesterday Ann expanded the cheerleading role. We finished our walk. Once in her car she set the vehicle’s trip meter. After prolonged hilarity about our blunders reading dashboard instruments, we figured out our round trip on the beach walk yesterday was six-tenths mile. I guess that means walking to the pier and back has now become a short-term goal with walking the entire paved walkway a mile one way and another mile back as a new long-term goal. And an even longer-term goal is to walk the Biloxi Bay Bridge. 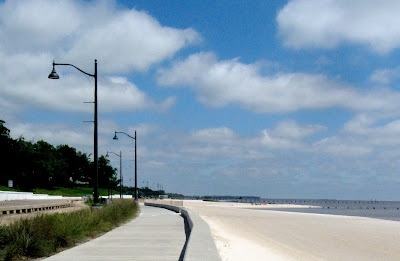 The new bridge that connects Ocean Springs and Biloxi replaced the one swept away by Katrina. It includes a 12-foot wide path that is spacious enough for both bridge walkers and cyclists. 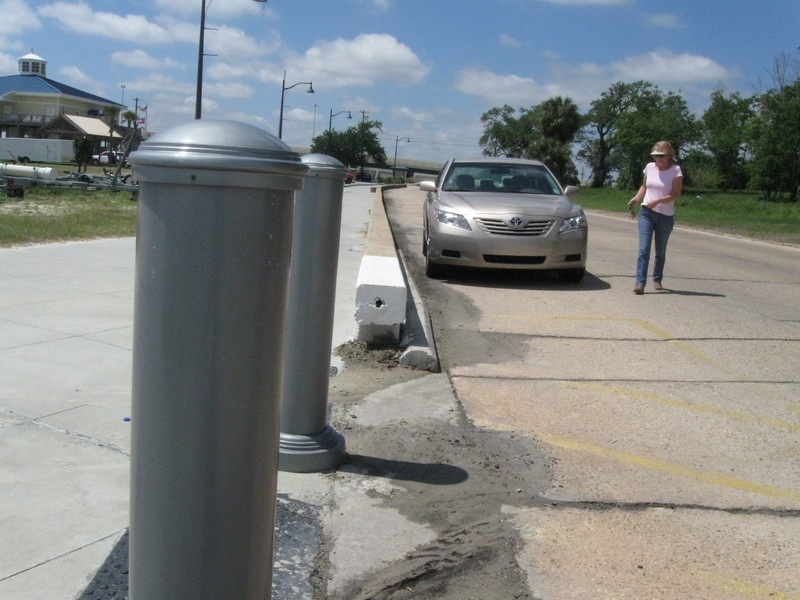 A large concrete barrier keeps people safe from vehicle traffic. Completing the trip over and back is 3.2-miles. A challenging uphill change in elevation comes with splendid views and breezes. Bridge walking has become an integral part of the culture of our town. But I am not going to think of my potential as a bridge walker right now. I will continue to take little nibbles of tasty challenges before contemplating huge feasts. I so admire your determination! You are making great progress! It looks like this is the perfect place for you to be! And I KNOW you will not only accomplish your goals, but even beyond them! I am so impressed with your goals but also in your walking buddies who try to expand those goals. Kudos to you both. you are blessed with friends to help and love you and it made me smile to read your story. i like the goals you have set, you are a very determined lady. some would have given up and just stayed in a chair. good job and keep walking. a beautiful spot for it. i have never walked a bridge and here it is a very dangerous thing to do. I think it is wonderful you have people who are willing to help you. Where would we all be without them? I love that attitude Linda. What a great place to walk with the pavement and glorious things to look at as you amble along. You are an encouregment to all of us.